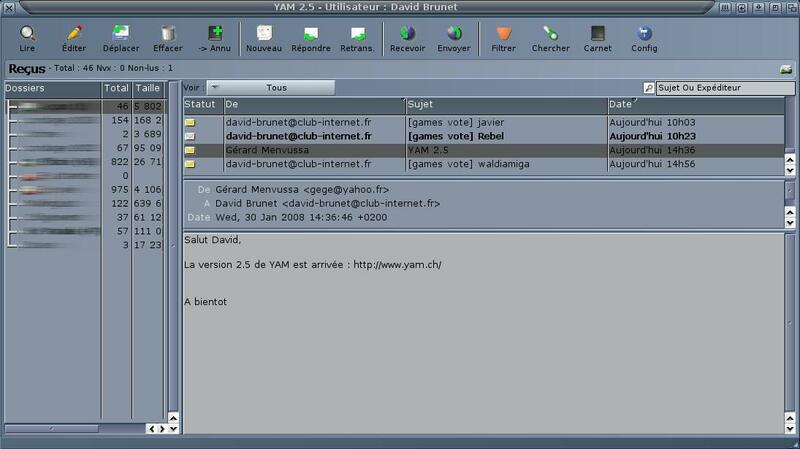 Description: MUI-based E-mail client by YAM Open Source Team. right away from there without having to touch your old installation. Afterwards you may manually import the mails from your old installation. using two completly different versions. popup a warning under certain circumstances when downloading mails. pressing the ALT key will directly reply to all (e.g. the mailing list). destination folder in case of a move-to-folder operation. - fixed a minor cosmetic bug where the wrong config page titles were displayed. an AND combination of rules. part of the mail text not allowing to save them as separate attachments. incorrectly added to YAMs emailcache mechanism. information part of the read window from working on MorphOS. the About window of YAM. startup to avoid being sent out by accident. to set complete disabled state of the whole filter. address book didn't actually add the address to the drop position. window wasn't updated if attachments were added in the 'attachments' tab. window is configured to be invisible for mail transfers. accessed via the corresponding main menu item. that no files which might get overwritten during the installation are locked. libraries and classes are really flushed from memory. complaining about these missing icons. popup button will be enabled to let the user select an existing pattern file. contained many UTF8 convertable characters. actually changed, please have a look at the included 'ChangeLog' file. of a language that YAM does not offer (anymore), then please contact us. See http://yam.ch/wiki/Localization for more information. consider joining the YAM Open Source team instead of doing it on your own. necessary information to contact us. We want to hear from you! which in turn should give you a new version more quickly. URL for more information on how to donate to us.